During this rainy, dark month, I crave colour. I wear a bright scarf, perhaps pink or cobalt, and put bright oranges on a cheerful plate from Mexico. Rosemary survives the winters here, and I dash out between the raindrops to clip a sprig or two to throw into a roast chicken, or a warming beef stew. Although it's only been a week since school started, I'm exhausted. A couple of days of filling in for another teacher turned into all week, and next as well. I came home on Thursday, completed knackered (don't you think that's a great word? ), and felt the need for a little self-care. The cheese, orange, and tea were lovely, but as someone who saw the photo on FB said, "where's the chocolate?" Where, indeed? I was all out. That was remedied today! We slept in today, then lingered over a bacon and egg breakfast. A bit of laundry, grocery shopping, and some house puttering filled the rest of the day. Puttering included repotting a couple of houseplants, and finding a home for this tiny succulent I bought. There's a hyacinth getting ready to bloom, as well. I've put it in the corner window where it will get the most of the pale, watery light. I ventured out to the garden, too, and discovered bluebell shoots poking up through decaying leaves. There are snowdrops, tightly closed, but with pearly beads showing through translucent tissue that will soon burst. My heart filled with such joy at the life appearing in the garden. From my window I see the maple tree beaded with silver on every branch. The raindrops catch the faint light and softly sparkle. I couldn't catch the sparkle on my camera, but imagine every branch beaded as the one above. This evening we're having shrimp tacos for dinner, and we'll watch a movie and/or read books. I'll light some candles and put the twinkle lights on. January is the time to practice coziness. How are you faring in this first month of the year? I'm so happy to see the signs of new growth in the garden. The first week back seemed stressful to me as well. Lovely bright Mexican dishes do lift my spirits. I bought a pink cashmere sweater last week and I plan to wear it until May.I love shrimp tacos. We ate them a few times during the vacation on the Oregon coast. There's nothing like fresh seafood. I've got a lot of reading to do this week-end. We have had rain for two days straight and in the high 50's. Today it was sunny, but wind gust to 40 MPH and temps in the low 20's with a real feel temp of 3 degrees. Just trying to stay warm here! Love the thought of cheese, oranges, chocolate and tea! Lorrie- What a nice way to brighten up the dreary, rainy (or snowy here) days of winter. I do love to see oranges in a pretty bowl. Sadly, I usually wear duller colors...lol. My kids tell me I wear black, black and olive and black. lol However, I do lighten up in the summer. Getting back into the pace of the routine at school are always difficult after the break. Hope you can rest up this weekend....and cheers to the bright colours! I love your blue and orange in the first photo and your coffee/tea mug. ;D Too cute. I'm sorry you had a rough week at school -- we'll hope for better next week. How wonderful that you have bluebells! Are they the English bluebells; I've seen Spanish bluebells on gardening websites, and I didn't know if people could get the English ones outside of England. Your shrimp tacos sound yummy. Have a lovely rest of the weekend, Lorrie! Haven't had shrimps in a long time. That taco idea sounds really great. Have a great Sunday. It is so strange how the winter seems to slow me down after the holidays. Somehow all the momentum of so much to do but having days to get off schedule inspires me. Then we get back to a hectic workday and by 8:00 I'm ready for bed! 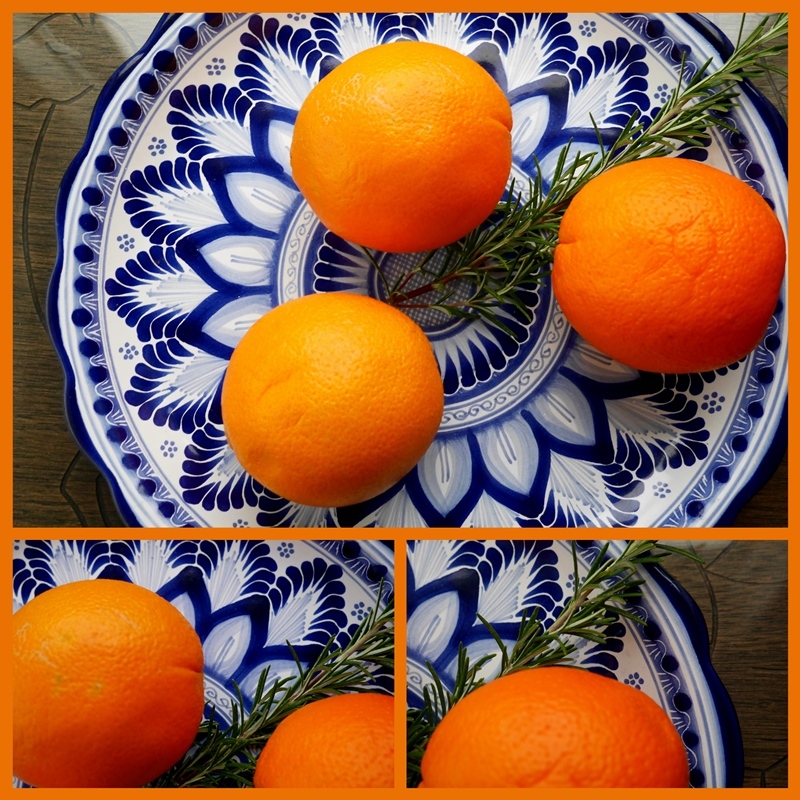 What a beautiful photograph with the oranges on that gorgeous blue plate. Sending you wishes for a wonderful week. Chocolate is an important staple that should always be kept in stock for "emergencies". Hee! I love lazy weekends where I can just putter around the house all day. We finally got Netflix so I've been enjoying catching up on shows that I've missed. I know how you feel because by Thursday I was almost crying I was so tired. I am so tired I can't sleep, not fun I know. Your photos are so peaceful. Wishing you a better week. Knackered perfectly explains that to the bone weariness. How am I faring? Better for having read your post. The beautiful plate and contrast of the oranges made for a beautiful photo. It certainly brightened a very dreary day here. It is blowing a gale with 80/90mph winds so not for the faint hearted. Hope you have a better week. Sounds like a lovely Saturday after your busy week. Your plants look wonderful and your tea accompaniments delicious and colorful. Glad you got that chocolate! Beautiful photos! I especially like the bluebell shoots poking through. Lovely to see the new growth coming through in the garden, we have had daffodils in bloom since the end f November, always a cheery sight. I like your mug, it has a much nicer title than mine which says "Drama Queen" and is from Jamie Oliver's ceramics range. Here in Normandy we're enjoying cosy meals in front of the fire, too, pure hygge. The early plant shoots brought back lovely Pacific Northwest memories ... it is such a hopeful thing to find those first signs. it won’t be long before I’ll be envying your Spring.... but right now I’m not missing the rain and gray at all. That snack however, with or without chocolate, would be perfect for me in any weather. Beautiful post. Love "Her Ladyship" mug. Orange on blue is one my favorites and just raises the spirits. The weather is nuts everywhere. Lovely to see the new shoots of bluebells. Happy Monday! Enjoy some chocolate and yes, knackered is a great word. !!!!! Good morning Lorrie! I love your idea of planting tiny succulent s in small pots. I crave colour as well and in the short days of January there are pops of colour here and there through the house. I wrote about the colours of our very cold January skies today and hope to link up with Mosaic Monday but everything I try to relearn is such a challenge. Keep smiling spring isn't far away in your corner of the world! We are in the 60s today so I feel like we are cheating! But I do wear more dark colors and long sleeves in the winter and get so tired of them after a month or so. I think I need some prettier winter tops! Hugs! Lorrie, Blue and orange is a great color combination. Great to sleep in. Thanks for sharing. Sylvia D.
Sounds like a lovely, restorative weekend after a taxing week! Oh, and your photos . . . they are always wonderful, but the ones in this post grabbed me today! January always seems like a good month for R&R. Your photos are beautiful, as always! We are enjoying the oranges over here as well...having fresh orange juice almost daily. Knackered is a wonderful description of exhaustion! Where's the chocolate? I would say "Where's the wine?" I can't believe you have shoots in the garden ... here, snow as far as the eye can see. But I won't complain - the month of January has been very good to us! Have a cozy week, and I hope it is not as exhausting! January is a month when I tend to feel a bit down and this year, with moving my mom and going through all of her things, it suits. It's keeping me busier than I want to be, but I can also feel the strength the Lord provides for every season. 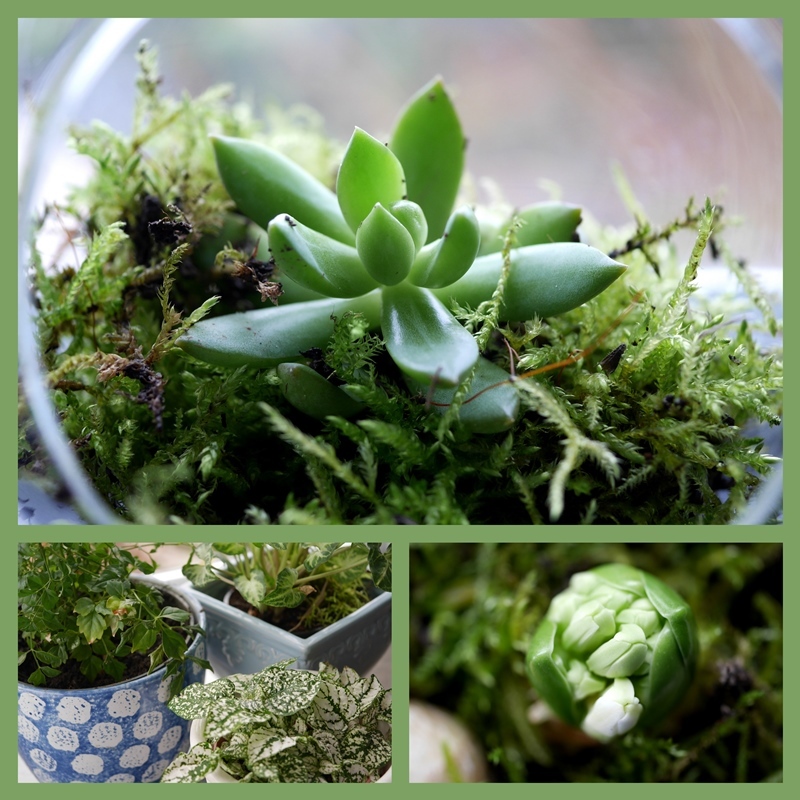 I love your plant collage and the signs of spring around the corner. Nice plate. Your choice so great. Perfect combination of plate and Oranges. Mandarin oranges have been high on my nibbling menu. It is indeed exciting to see things pushing through the ground. And candles and twinkling lights save the day for me in January and February. I found a new string of battery lights that I have hung over the mantle and loving just that little touch of light. I also crave oranges in the winter. I guess I need the extra Vitamin C, or maybe their bright and cheerful color? We are having a very mild winter so far this year, so I feel like I'm on vacation in a different state. It seems the east coast is getting all the cold and snow. It's nice not to have to shovel lots of snow! I love your blog, I followed awhile ago but have not been in awhile. I sure wish I was in Canada. Living in Michigan is beautiful but I am English and miss the Springtime. I looks as though it comes early for you there. Such lovely photographs, especially the mix of gorgeous colours in your first mosaic. I hope your week has gone well, it certainly has passed by quickly. The oranges on the plate are surely the most beautiful and cheering sight. They might have been a few inches away on my desk, the way the scene jumped out at me. You are a good woman to pattern oneself after, in making winter cozy and bright. I like your wording "practice coziness"... indeed with all the grayness in January, doing cozy things is just the best way to enjoy this month! I love the bright colors of the oranges, and their sweet flavor this time of year is nothing short of amazing! I'm sorry you had such a rough week or two at school. Teaching is exhausting just in itself, but to carry another's load, oh my. Bless your heart! Hoping the weekend of relaxing has helped. We are enjoying several rounds of snow here today, much better than rain, although the snow is really not sticking. Still, it's lovely! I am all for finding reasons to stay cozy :) Hugs to you today dear friend!